Urban Meyer is collecting national championships, and he's not slowing down. Wherever he goes, greatness immediately follows, and you can always look for his teams to be highly-ranked contenders when bowl season rolls around. But is Meyer the best college football coach of all time? In Urban Meyer vs. College Football, author Ben Axelrod explains exactly what separates Meyer from his peers and compares his accomplishments to some of the all-time legends like Nick Saban, Bear Bryant, and Joe Paterno. From his playing days at University of Cincinnati to his first Buckeyes stint as an assistant under Earle Bruce, to his victories at at the helm of Florida and Ohio State, Meyer has a ferocious, undeniable talent for coaching that may be unparalleled in football history. Ben Axelrod is a senior writer covering Ohio State at Land of 10, hosts the "Inside the Shoe" podcast and has been covering OSU sports since 2009. He previously covered the team at Bleacher Report, Buckeye Sports Bulletin/Scout.com and Rivals.com. Axelrod is a 2011 graduate of The Ohio State University and this is his first book. College football team is made up of students, young men who, despite their size and skill, are still developing into the men they will be for the rest of their lives. To lead them requires more than a clipboard filled with X’s and O’s. It requires a teacher capable of inspiring and guiding his team to success on and off the field. Nobody has achieved this goal as consistently as Urban Meyer. 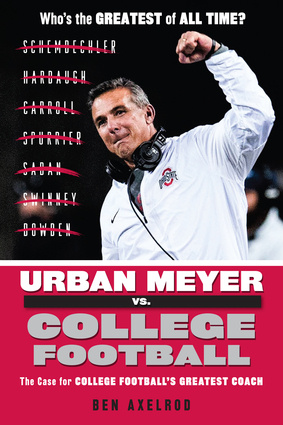 Urban Meyer vs. College Football offers a thorough and thoughtful look at the unique career of one of the game’s iconic personalities. Both diehards and the new generation of college football fans will find value in the pages of this great new title.